Nothing really jumps out at me as an egregious surprise. I'm a little surprised that Alex Bregman at No. 7 ranked higher than Jose Ramirez at No. 14, mostly because Ramirez has had back-to-back top-three MVP finishes, while Bregman has had just one big season. I'm a little surprised that Joey Votto fell only 17 spots to No. 26. While he led the NL in OBP, he had just 12 home runs and 42 extra-base hits -- not the kind of power production you expect from a first baseman. Of course, both Bregman and Votto are eminently capable of justifying their rankings. I think probably too many of us have jumped off the Kris Bryant bandwagon a little too quickly. He's still a top-10 or top-15 player in my book, so No. 21 is a little light. Are we really saying we'd take J.D. Martinez over him? Blake Snell? Still and all, though, I think this was a pretty solid ranking of players. Nothing jumps out at me, really. I'd classify J.T. Realmuto (No. 28) as someone who maybe hopped out at me. I mean, there's no denying that he's a quality player on both sides of the ball. But top-30 seems a little high to me. Maybe all the offseason trade buzz filtered in here somehow and pushed him about 10 or 15 spots ahead of where he should be. I definitely wouldn't put him ahead of Anthony Rendon. Nobody is going to make the top 30 about whom I'm going to have much bad to say, but if I'm picking somebody I could most easily see falling into the 70s or 80s after this year, it'd be Blake Snell (No. 12). His track record as a truly elite pitcher is short, and he still has to work around more walks than his peers at the top of this list. Here we have him as the fourth-best pitcher in baseball; according to ZiPS, to pick one projection system, he's "only" 17th. That's still phenomenal, but it's a tier below this. : A little too high. The guy two spots below him is Mitch Haniger, who produced a 6.1-WAR season in 2018. The only 20-year-old position players to produce even 5.0 WAR since 1960 are Johnny Bench, Ken Griffey Jr., Jason Heyward, Manny Machado and Mike Trout. There's no doubt that Vladdy Jr. can hit, but I'm not sure he's the all-around player those guys were, and I'm not completely convinced he's going to be a big-time power hitter at age 20. A tad high. Certainly Ronald Acuna Jr. and Juan Soto showed that very young standout prospects can have immediate impacts. Guerrero is more than capable of following in their shoes. But in terms of expectation for his rookie season, somewhere in the 80-90 range is probably more appropriate. But 68 is a reasonable slot. I actually thought it might be higher, just because the hype machine has been so relentless. My gut says he's too high and that for all the (justifiable) hype, it's time for a little brake-pumping. Then again, last year's stud rookies (Acuna and Soto) finished 42nd and 43rd in position player WAR last season. Mix in the pitchers and that puts them in the 60-something range. So it comes down to this: Will Vlad Jr. make as much of an impact as Acuna and Soto did last season? Maybe. But the fact that he's already dinged up (oblique) casts some doubt. Boy, I don't know. I see my colleagues here saying "too high," but then I look at most of the names around him and none of them makes me happy like Vladito makes me happy. So I'm saying too low. Going just by how happy he makes me, he should probably be second on this list. He hasn't done anything to prove that he belongs in the top tier of this list, but he has done even less to disprove it. Cody Bellinger fell off from his big rookie season, so he slid 38 spots, from No. 23 to No. 61. I think he's going to have a better season, with more home runs, a better walk rate and a higher OBP. In fact, he's on my short list of NL MVP candidates. I'm naming two, since they are both Dodgers and rated closely together: Corey Seager (No. 49) and Justin Turner (No. 53). Both are easily top-30 players if healthy, and by all appearances, they appear to be. If Seager can get into 140-150 games, he's probably more like top-15 and is more than capable of making a run at National League MVP. Dave is right about Bellinger as well. Like Brad, I'm all aboard the Turner train -- the other Turner. Trea Turnerisn'tthe .342 hitter that his rookie season suggested. But he isn't the .271 guy he was last season, either. Somewhere in between lies the truth. His plate discipline was much improved last year (69 walks), and his power will continue to come (19 HRs in 2018). If Adam Eaton stays healthy at the top of the Nats lineup and with a full year of Juan Soto hitting behind him, Turner (No. 54) could be in for a big year. German Marquez (No. 81) had a 2.61 ERA in the second half last year and backed it up with 12 strikeouts per nine innings and six K's for every walk. 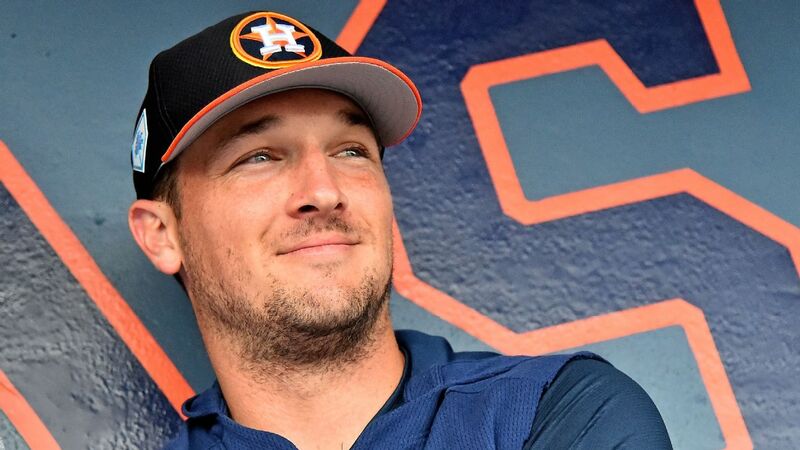 His K rate went up every month of the season, and in September, he struck out 37.5 percent of batters -- a mark that only Max Scherzer, Gerrit Cole, Chris Sale, Blake Snell, Justin Verlander and James Paxton managed to top in any month last season. He did all this as a Rockie. He's a miracle. Mookie Betts is the obvious candidate since you can argue that 2018 was the first season when there actually was somebody better than Trout. But my other choice is Juan Soto because he has a chance to be the best hitter in the game, cranking out .450 OBPs with 35-plus home runs. What he did as a teenager -- .292/.406/.517 -- was so unfathomably impressive that I might even be underestimating his upside. This is the topic for my column running on Friday, so I must abstain. Stay tuned. Mookie Betts. I know, boring pick, but it's pure logic here. If Trout isn't the best player in baseball, then Mookie is. If Trout stumbles for some reason (injury or otherwise), Mookie's the obvious heir to the throne. He's only 26, so the five-year hypothetical window takes him to age 31, at which point he'll still be at or near his prime. After Betts, my order of succession is Lindor, Bregman, Acuna. Francisco Lindor is an elite shortstop who just hit 38 homers and stole 25 bases as a 24-year-old. His 7.9 WAR last season is already better than that of the average MVP winner, he draws a few more walks each year, and he's still carrying a ton of doubles that might turn into even more home runs. Mookie, of course, must be mentioned, but Lindor's stats at 23-24 have looked a fair bit like Alex Rodriguez's at 22-23.